Enriched with minerals, milk enzymes and Aloe Vera gel, it deep cleanses the skin, removes dead cells and prevents melanin production that causes skin darkening. It also eliminates excess sebum, dirt and impurities. Result :Brighter and radiant skin. Explore the entire range of Cleanser available on Nykaa. 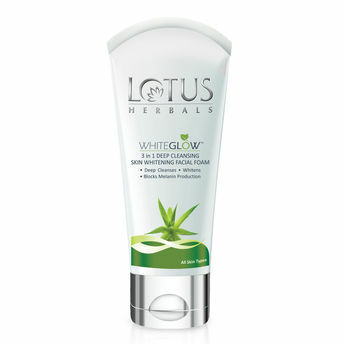 Shop more Lotus Herbals products here.You can browse through the complete world of Lotus Herbals Cleanser .Alternatively, you can also find many more products from the Lotus Herbals Whiteglow 3-in-1 Deep Cleansing Skin Whitening Facial Foam range.